LG V10 expected price in India is ₹25,999. While most smartphones are bumping up hardware spec-sheets and pumping in more glass and metal, LG once again tries to do things differently with LG V1O. Featuring several innovations to keep things fresh, LG V10 seems worthy of the flagship tag. Though internal horsepower remains same as LG G4, the smartphone improves in several key aspects. A fingerprint sensor, which is more of a necessity these days, has been added. The cheap-feel plastic paves way for more premium materials and a sturdy steel frame, making it eligible to withstand 1.2m falls, and then there are dual displays, and dual selfie cameras to marvel at. Besides the super sharp 518PPI primary display, a 2.1 Inch screen has been added on top, which showcases weather info, notifications, clock, music controls, etc when the display is off. When the display is on, the same screen shows app shortcuts and you can use those for quick app switching (though one handed use should be difficult because of the sheer size). LG says that a single wide angle lens can cause distortions at the selfie edges, and to fix the issue, it has incorporated 2 standard 80 degree lens 5MP cameras on the front. The camera software will stitch images from both of these snappers and ultimately you will be blessed with ultra wide angle selfies. You can also shoot videos in pro mode from the rear 16MP camera. You can toggle with shutter speed, ISO, white balance and shoot 4K videos in 21:9 cinematic resolution. That’s not all. You can also simultaneously shoot ‘multi-view videos’ from both front and rear cameras. Since our smartphones can now shoot 4K, it was only a matter of time before OEMs allowed users to toggle with these deeper aspects. The Snapdragon 808 inside is more than capable for your every need, and is paired with ample 4GB RAM and 64GB storage. If you need more, you can plug in up to 2TB SD card as well. All these features will also bloat the price. We are not certain when you will be able to actually buy LG V10 Online in India, but it should take some time. 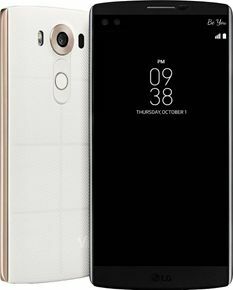 You can check the comparison tab to find the best price of LG V10 in India. Removable battery and expandable memory. Heavy bloatware and UI layer. IR port.. can be used as a remote for TV, AC, Audio player,etc.